It’s that time again…time to shop for Back to School! We have donated backpacks, shared a back to school dinner and baked some Back to School Cupcakes. Many years ago, when my boys were all young, I created a Homework Box. It’s important to have all of the supplies that they need at school, but what about when they come home from school and need supplies to complete their homework? 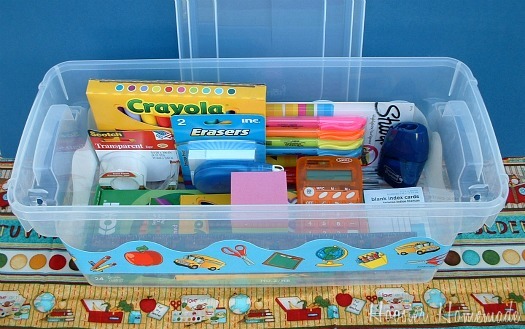 You can make your Homework Box as simple or complex as you need. I added some of the items that my teenagers will need, but just had to add the cute border too. The border comes in long strips, that teachers can also use in classroom decorating. I just used Modge Podge to apply it to the box. What can I say? I’m a little geeky when it comes to school supplies. I even filled a tote bag to donate to a local teacher, watch for that next week! And of course, we can’t forget about cupcake decorating supplies, watch for a tutorial on this soon! Disclosure: This post is part of a campaign I am participating in with the Walmart Moms. Walmart has provided me with compensation for this post. My participation is voluntary and opinions, as always are my own. This is a super and easy to do idea. Thanks for sharing it. Who doesn’t love having shiny new school supplies? That makes me want it! Great idea–just in time for school! I would be happy to have you share this and any other idea you would like to link up to “One Creative Weekend” at OneCreativeMommy.com. Yay for shoe boxes! Another great idea! So cute! Great idea! That would definitely make it easier to get started on homework, not needing to track down supplies. What a great idea. The ex-teacher in me really appreciates that you value homework time! I’m going to feature this on my weekend wrap-up on Saturday and link back to you. I’m a school supplies geek too! We have similar box at our kids desks at home. Then they aren’t digging around making messes trying to find their stuff. Love the added border! I use these for EVERYTHING LIZ!!! =) Gotta love storage boxes! 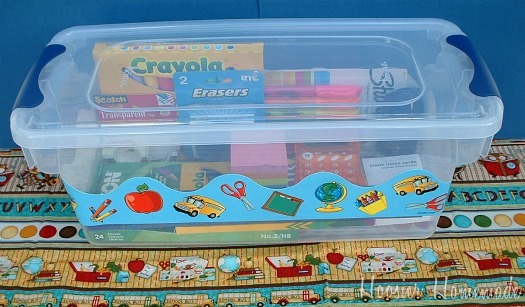 The homework box is a nifty idea! I agree with Christina. As a teacher, I too have many children who don’t turn in. 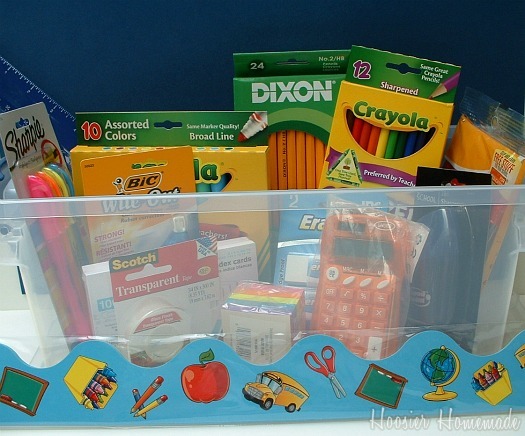 I think we DO assume at times that there is a parent at home at night and children all live in neat and orderly homes with a nice box of supplies so my suggestion is…when making a box for your child, make another and give it to your child’s teacher to give to a child who really needs it. I also pick up lots of extras no only for the classroom but for “Operation Christ Child”. Crayola Crayons are .29 at Walmart (4 max) so I go back each time to get more! This is a great idea. You wouldn’t believe how many homework assignments are not turned in because a student claims they didn’t have paper, pencil, etc. at home. I always give them the materials and a night to make it up- unless it’s habitual. It would be nice for parents to help in this way.